Home Tags Posts tagged with "easy appetizer recipe"
Fall is the perfect time for soothing, warm soups. It’s also freaking crazy busy! Costumes, decorations, parties, recitals and I am out of time for some fancy thing to entertain with tonight. 5 minutes pumpkin soup to the rescue, with fresh sage and a beautiful appearance, everyone will think it was a labor of Autumn love- ha ha. 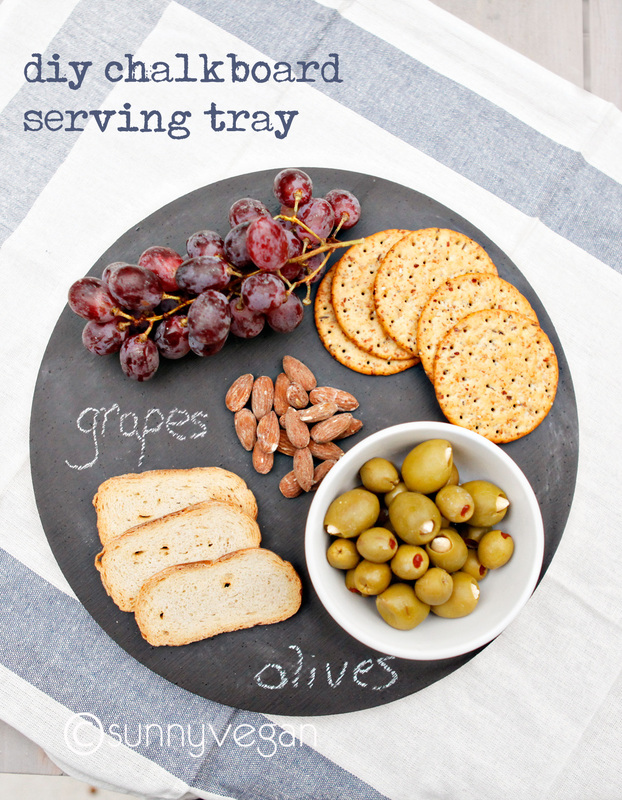 Pair with a salad or crusty bread for a complete meal, or serve as an appetizer , any way you have it you can’t go wrong! 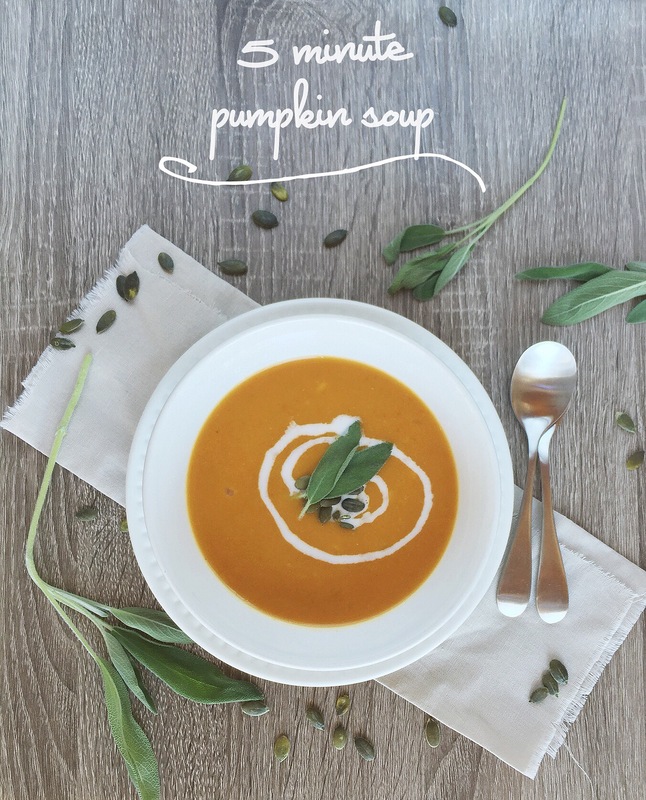 If you are interested in other pumpkin recipes, check out my thai pumpkin soup, pumpkin sage pasta, or pumpkin granola. Can you tell that I really love pumpkin?! heat olive oil in medium saucepan, medium heat. add onion and garlic, and cook until soft, about 2 minutes. add remaining ingredients and heat through, remove sage leaves and serve immediately. * I garnished with a drizzle of coconut milk, pumpkin seeds and fresh sage. Other topping ideas include, maple syrup, walnuts, green onions, croutons, nutmeg, sesame seeds or nutritional yeast. As I am generally cooking for kids as well as adults, I tend to keep the base recipes fairly simple and add red pepper flakes to the adult servings. If just making for adults, feel free to spice it up! Did you know that antipasto has nothing to do with not liking pasta? No really, it’s not anti-pasta, it means “before the meal” and is the traditional first course in a formal Italian meal known as appetizers here. As we are a family of snackers, these cute and healthy kabobs were a hit as we start the tailgating season. I know they look a little elegant for tailgating, but if you had a pile of these in a cup or on a paper plate, they will taste just as wonderful! So many tailgating foods are full of fat, cholesterol, sodium and calories. Combining not-so-healthy snacks with mindless eating for hours in front of the tv or in a parking lot is a perfect recipe for heartburn, indigestion, and spending half the game in the restroom! Not my kinda fun. My friends over at Nuts.com have more healthy snack ideas for you, be sure to check it out. I recently found their site and LOVE their selection or organic and raw nuts, yum! I decided to go with skewers because pretty much everything taste better when eaten off a stick. Not only that, but since you don’t need any utensils, you can just grab a skewer and get back to the game! Of course I wanted them to be super pretty, but the taste combination was amazing! The sweet tomato followed by cool basil and tofu, then a zing from the artichoke and olive, all topped off with a homemade sourdough crouton was an unexpected hit. The fact that they are super easy to make means that we may just have a new fave appetizer in the house. marinate cubed tofu in italian dressing for at least one hour. brush bread cubes with olive oil then toast in skillet or grill pan over medium heat until lightly browned, turn over and brown other side, allow to cool and sprinkle with salt and pepper. 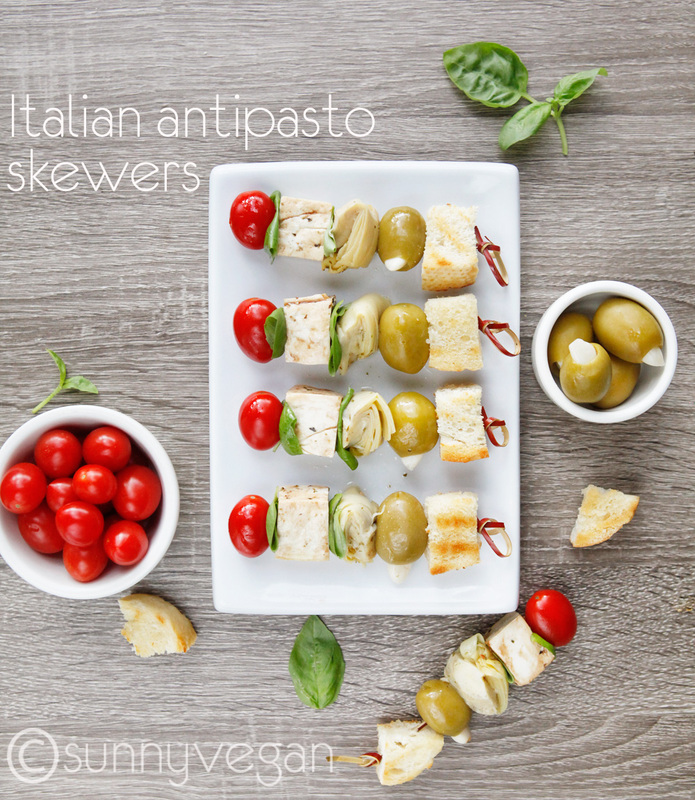 assemble skewers in desired order, refrigerate or serve immediately.